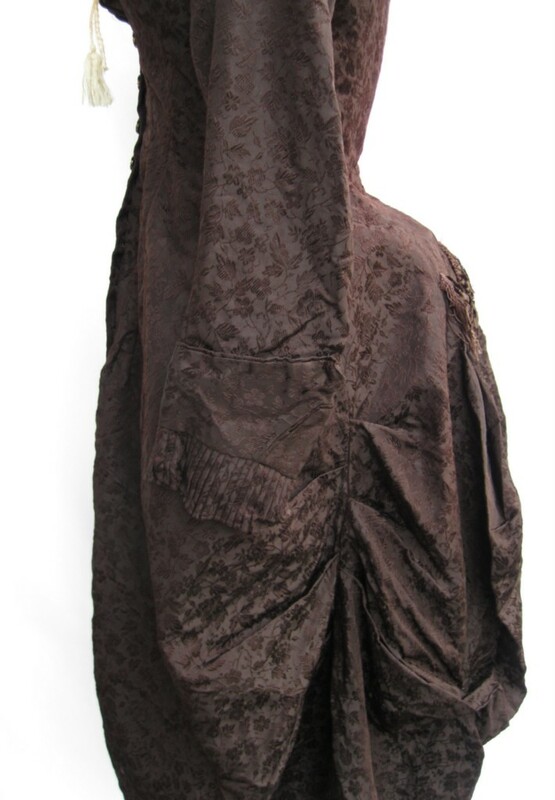 Fabric is a light to medium weight brocade – possibly a blend of silk and cotton … dark black-burgundy in colour. The background is ribbed like faille –and has a muted sheen … the floral design has a silky feel and has a medium sheen. 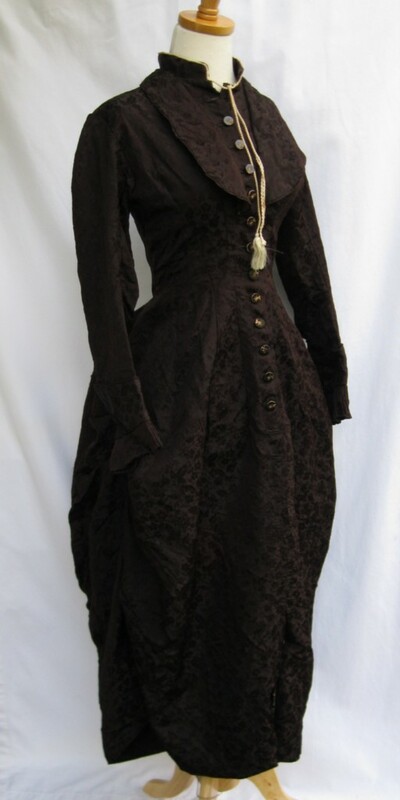 The dress bodice is lined with a light-weight cotton – tan ion colour … the back of the skirt is lined with a semi-sheer cotton gauzy muslin – black in colour. Buttons: These buttons are BEAUTIFUL. I am not sure what they are made of. They may be brass – with black laquer on top. Or they may be glass. Please see the detailed photos to decide for yourself. 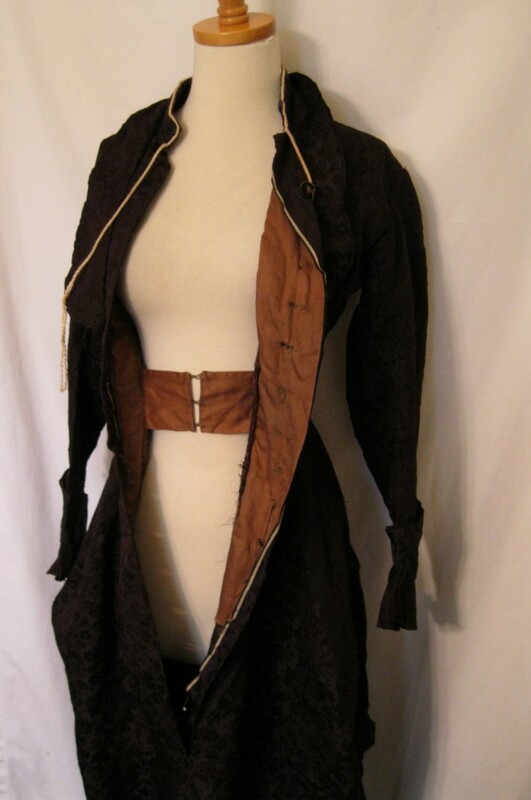 Some of the buttons show wear along the sides – and the gold colour is showing through the black – this is what makes me think they may be brass – covered in black laquer. It looks like a gold palm leaf design with bright shiny gold carvings – and the black colour is super shiny like glass. They also sound like glass when you tap them together. Design: abbreviated stand-up collar with braided trim that ties in front … lapel style fins down front … 12 amazing buttons down center front (should be 15 – missing 3) … long vertical darts along bodice (front and back) … narrow sleeves with an angled/wrapped detail above cuff – finished with a cuff with tiny accordion pleats … full skirt with pleats and gathers similar to balloon-style curtains – down sides and along back – giving a sizable bustle … fringe detail along center of bustle. 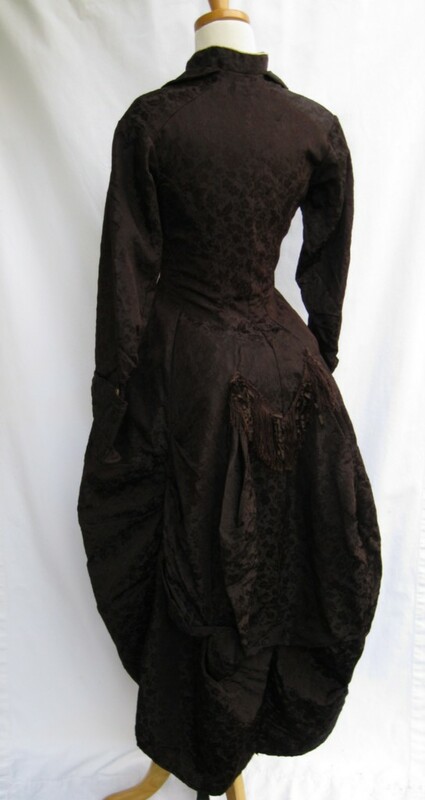 Dress is shown with a small bustle – this bustle is not included in the auction. Very Good Vintage Condition!! 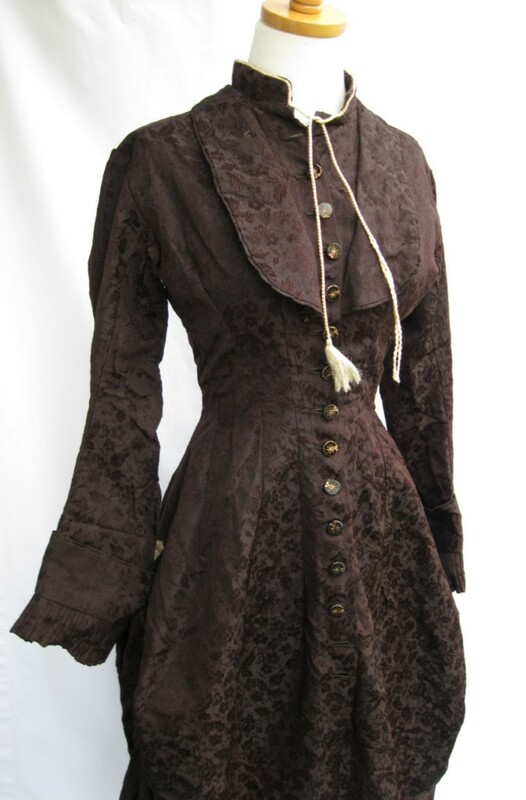 I believe this may be the original colour – it appears to be like a dark chocolate-burgandy. 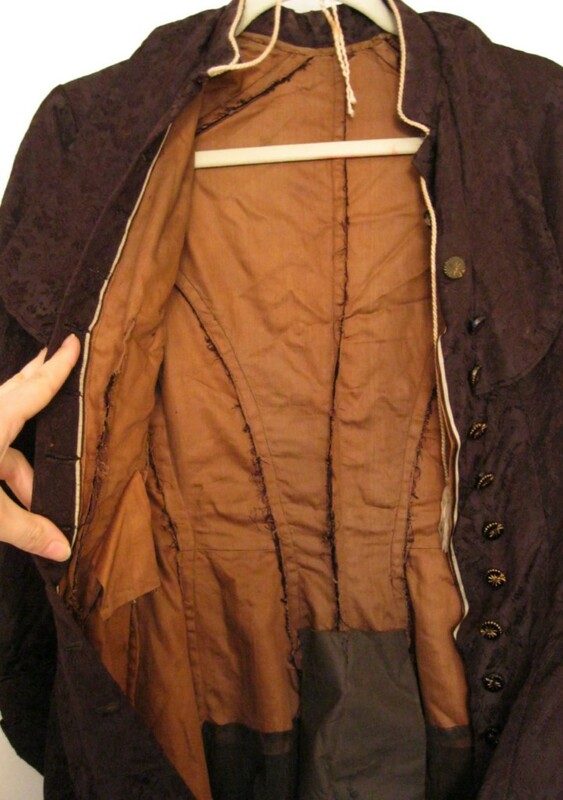 Usually when fabric fades to a red tint – it is uneven – and does not fade in folds and sections not exposed to the light. This colour is uniform throughout. 3 of the buttons are missing. The gauzy lining on the inside of the skirt is deteriorating. The braided trim along the collar has become unwoven on one side. Lastly, the armpits have turned bright red along seams – due to sweating. This is still an amazing piece of history – and would be a great addition for any collector. 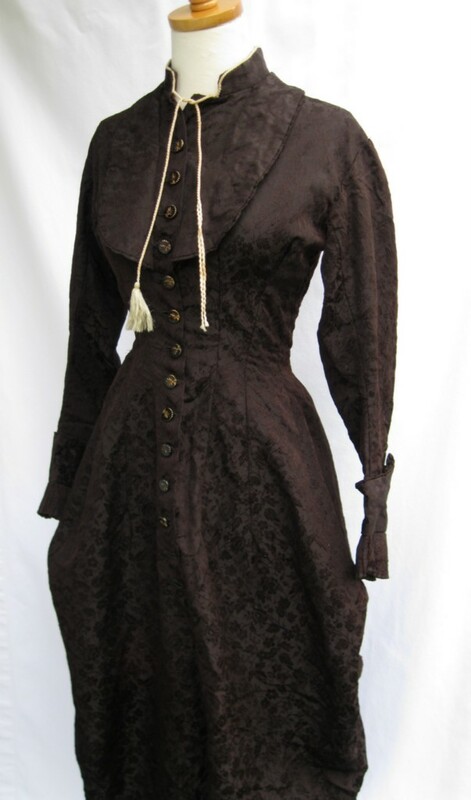 This dress has been in storage for over 100 years and thus should be cleaned before wear or display.